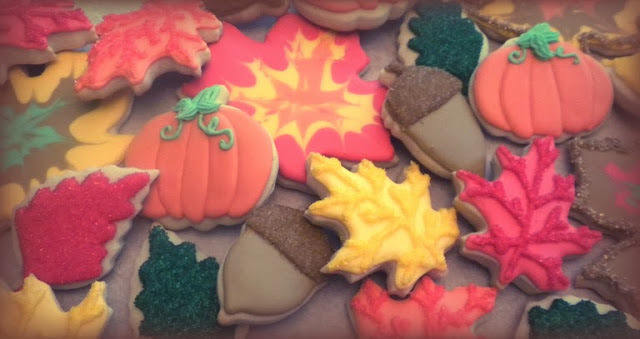 Sweet Treats by Sarah: Thanksgiving Cookies Ready! Finished up our colorful Thanksgiving cookies! Packed and ready to go to dinners and parties. We boxed up some with adorable "I'm Thankful for You" and "Gobble Gobble" tags you can print here. I think I will hunt down a smaller acorn cutter for next year so they don't look so gigantic next to the leaves. If anyone is interested in placing an order for Holiday cookies, please contact me by December 7th.